A march against US drone strikes in Pakistan led by cricketer-turned-politician Imran Khan was stopped by the Army on the edge of the nation's lawless tribal belt due to fears of a possible militant attacks on the rallyists, which also included American anti-war activists. Drones could soon handle mid-air refuelling by themselves, without the involvement of human pilots, US military flight tests have shown. The findings raise the possibility of automated "flying gas stations" topping off robotic aircraft over future battlefields. Hugo Chavez loyalists blew bugles in a wake up call for voters on Sunday as the Venezuelan leader faced the biggest electoral challenge yet to his socialist rule from a young rival tapping into discontent over crime and cronyism. Henrique Capriles, a centrist state governor, edged toward the still-popular Chavez in final polls thanks to a vigorous campaign that united the opposition and made him its best chance of ending the president's 14-year tenure. 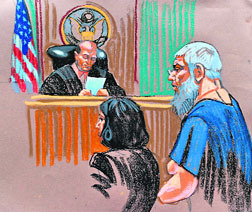 Hours after he was extradited from the UK to face terrorism charges and a possible life sentence, one-eyed radical Islamic cleric Abu Hamza al-Masri made his first appearance in a US court, which ordered that he be held under detention till his formal arraignment on October 9. Egyptian-born Hamza, who faces charges like involvement in hostage-taking and conspiracy to set up an al-Qaeda-style militant training, arrived in New York yesterday along with two other terror suspects Adel Abdel Bary and Khaled al-Fawwaz on a chartered flight. Controversial WikiLeaks founder Julian Assange is reportedly set to target Australian Prime Minister Julia Gillard in a possible defamation case. According to a report in 'The Age' today, Assange has hired lawyers to look at different ways in which he can sue Gillard for defamation over the claim that WikiLeaks acted illegally in releasing a quarter of a million US diplomatic cables. America's longest war entered its 12th year today, with the anniversary marked by a Taliban statement claiming that NATO forces are "fleeing Afghanistan" in "humiliation and disgrace". Several thousand people marched in downtown Madrid today to protest austerity measures they say will lead to cuts in cherished national health care and the privatisation of public services. Marching under banners reading "Neither cuts nor privatizations," many protesters were civil servants hit with a wage freeze next year. A Maldivian court today ordered the arrest of the country's first democratically-elected President Mohamed Nasheed after he questioned legitimacy of a special court to try him on charges of abuse of power while he was in office. A motorcade of scores of vehicles was turned back by the Army just a few kilometres from the boundary of volatile South Waziristan Agency, forcing the Pakistan Tehrik-e-Insaf chief to cancel his plans to address a gathering at Kotkai village in the tribal region. 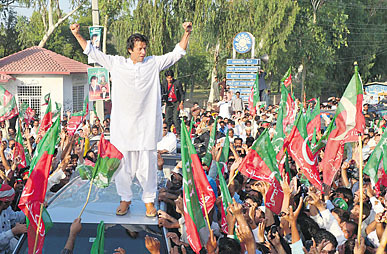 Imran then led his supporters back to Tank, a town in Khyber-Pakhtunkhwa province that adjoins the tribal region, and addressed a gathering of a few thousand people. Imran said that several innocent people were arrested on charges of terrorism in the war against terror. He said that he was not afraid of his own security but was concerned about the safety of the participants in the rally. He added that the US drone strikes were in violation of human rights and international law. He criticised President Zardari for complicity in US drone attacks while publicly opposing them. Predicting that his party would sweep to power after elections, Imran told the tribal people that peace would return to their land. "We will spend money on your development and education. Your will not have to go to any other place for jobs but will get all opportunities in Waziristan itself" Khan stated. "We came all the way to Waziristan. Soon, I will call on you to come to Islamabad," he said, referring to his party's claim that it would come to power in the polls. "We want to give a message to America that the more you carry out drone attacks, the more people will hate you," he told his supporters. In a message posted on Twitter, Khan said he was told "by the Army that (there was) serious danger ahead" on the path to the tribal belt. "Did not want to risk lives and turned back," he said. Other leaders of the Pakistan Tehrik-e-Insaf tweeted the Army had advised them to turn back as there was a "real danger of (an) ambush". A small contingent of US anti-war activists from the women's group Code Pink joined the march. They claimed the drone strikes, contrary to the claims of the US administration, have killed many civilians and not just Taliban and Al-Qaida elements. The American activists apologised for their government's actions and led the people in shouting slogans like "bandh karo drone hamle bandh karo". The Central Intelligence Agency (CIA) regularly uses unmanned drones to target militants in countries like Pakistan, Afghanistan and Yemen. The US Defence Advanced Research Projects Agency (DARPA) recently flew two modified RQ-4 Global Hawk drones in close proximity to simulate mid-air refuelling. The Global Hawks, huge drones with 131-foot wingspans used for high-altitude surveillance, flew in formation with less than 100 feet separating the refuelling "probe" on one and refuelling "receiver" on the other during a two-and-a-half hour flight test. "The goal of this demonstration was to create the expectation that future High Altitude Long Endurance aircraft will be refuelled in flight," Jim McCormick, programme manager at DARPA said. "Such designs should be more affordable to own and operate across a range of mission profiles than systems built to satisfy the most stressing case without refuelling. "The lessons from AHR certainly extend beyond the HALE flight regime, and insights into non-traditional tanker concepts may offer further operational advantages," McCormick said in a statement. Neither Global Hawk drone needed human guidance during the final flight test at the high altitude of 44,800 feet. The drones also maintained their tight formation despite turns and wind gusts of up to 37 Kph. DARPA had kicked off its two-year Autonomous High-Altitude Refuelling (AHR) program with the expectation that just one out of six aerial refuelling attempts would prove successful. 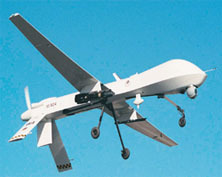 The final analysis, however, suggested drones could achieve a much better success rate of three out of five attempts. The results from the AHR programme that ended on September 30 mean the US military has a good chance of extending the duration and range of its drone swarms, the statement said. According to 'Tech News Daily', manned fighter jets and bombers already do mid-air refuelling from standard tanker aircraft, but many drones can't match the speed, altitude or performance of existing tanker aircraft. Hugo Chavez loyalists blew bugles in a wake up call for voters on Sunday as the Venezuelan leader faced the biggest electoral challenge yet to his socialist rule from a young rival tapping into discontent over crime and cronyism. Henrique Capriles, a centrist state governor, edged toward the still-popular Chavez in final polls thanks to a vigorous campaign that united the opposition and made him its best chance of ending the president's 14-year tenure. Chavez has used record oil revenue to support ideological allies around the world while preaching a fiercely anti-American line, so the election is being watched eagerly from the United States to Belarus and Iran. Queues formed at some polling centers long before they opened, and despite a few delays voting was going smoothly. "The battle has started!" the flamboyant former soldier wrote in an early morning rallying cry on Twitter. "Today we will write another chapter in history." Chavez loyalists in poor neighborhoods, where he draws his most fervent following, blew bugles and trumpets in the predawn wake-up call. In the center of Caracas, some red-clad fans shouted "Long live Chavez!" from the back of trucks. Chavez, 58, staged a remarkable comeback from cancer this year. But he could not match the energy of past campaigns - or the pace set by his 40-year-old basketball-loving opponent. "Today we decide the future of our Venezuela," Capriles said on Twitter. "Today we are millions of Davids! God will be our guide," he added, referring to his depiction of the vote as the biblical underdog's battle against Goliath. Capriles had prepared for the election by hiking a mountain trail on the edge of Caracas on Saturday, donning sports gear and mirrored sunglasses and posing for pictures with supporters.Opposition supporters had banged pots and pans in an overnight protest against the president in parts of the capital. 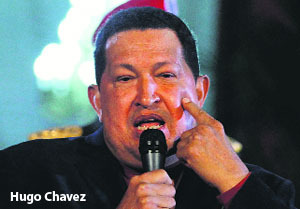 Most well-known pollsters put Chavez in front. But two have Capriles just ahead, and his numbers have crept up in others. There is a risk of violence if the result is contested. 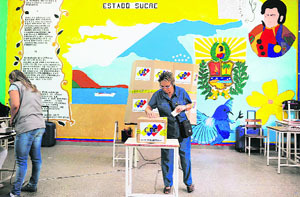 There are no formal international observers, but a delegation from the UNASUR group of South American nations, led by an Argentine politician, is in Venezuela to "accompany" the vote. Hours after he was extradited from the UK to face terrorism charges and a possible life sentence, one-eyed radical Islamic cleric Abu Hamza al-Masri made his first appearance in a US court, which ordered that he be held under detention till his formal arraignment on October 9. Egyptian-born Hamza, who faces charges like involvement in hostage-taking and conspiracy to set up an al-Qaeda-style militant training, arrived in New York yesterday along with two other terror suspects Adel Abdel Bary and Khaled al-Fawwaz on a chartered flight. Two other suspects Babar Ahmad and Talha Ahsa were flown in separately after the five men were extradited from the UK. Hamza, Bary and Fawwaz had arrived at Westchester County Airport north of New York City in a Gulfstream V aircraft, the FBI said. Fawwaz, 50, and Bary, 52, were arraigned before US Magistrate Judge Frank Maas at the District Court in Manhattan in a brief hearing during which both entered not guilty pleas through their defence lawyers. Hamza, who is yet to enter his plea, did not speak at his first appearance yesterday at the same court, where he appeared before Maas separately after the hearing for Fawwaz and Bary. Maas ordered that all three men be detained and they are scheduled to appear before federal judges in New York on October 9. Wearing navy blue jail fatigues, Hamza did not have the hooks that he wears in place of his hands which he lost in injuries apparently sustained in Afghanistan. Amid high security, authorities had temporarily removed Hamza's prosthetic limbs. Hamza's lawyer Sabrina Shroff asked the federal judge that he be given a prosthetic device. She also requested he be fitted for special shoes, given access to a dictation device because of his disability and be allowed to take diabetes medication. Assange, 41, spoke about his plans to sue Gillard during an interview given to an Australian activist group GetUP! in London where he has been holed up since June 19 in the Ecuadorian embassy. Assange has taken shelter at the embassy to try and avoid extradition to Sweden, where he is wanted for questioning over sexual assault allegations. He said Gillard's comment, which she made in 2010, influenced MasterCard Australia to join an online financial blockade of the organisation. Assange said he would be vulnerable to arrest in Sweden by the United States Justice Department, which is examining the possibility of charging people associated with WikiLeaks with espionage over the online publication of the classified cables in 2010. He told the interviewer that WikiLeaks' work had been stymied by Gillard's comments. The US led the invasion on October 7, 2001, to topple the Taliban government for harbouring Al-Qaida leader Osama bin Laden after the September 11 attacks on New York and Washington. The Taliban were quickly routed, but launched an insurgency that grew in strength over the years until NATO had some 130,000 troops from 50 countries defending the Western-backed government of President Hamid Karzai. The troops have now begun pulling out and all foreign combat forces will be gone by the end of 2014 according to a withdrawal schedule agreed by the US and NATO. "With the help of Allah, the valiant Afghans under the Jihadi leadership of Islamic Emirate defeated the military might and numerous strategies of America and NATO alliance," the Taliban said in a statement today. "And now after eleven years of unceasing terror, tyranny, crimes and savagery, they are fleeing Afghanistan with such humiliation and disgrace that they are struggling to provide an explanation". A total of 3,199 NATO soldiers have been killed in the war, more than 2,000 of them Americans. Most deaths occurred in the past five years as Taliban attacks escalated, according to icasualties.com. 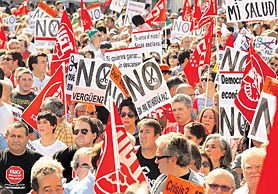 Several thousand people marched in downtown Madrid today to protest austerity measures they say will lead to cuts in cherished national health care and the privatisation of public services. "I work in a hospital, but I'm about to end up unemployed," 58-year-old nurse Victoria Gutierrez said. "On Oct 30, my temporary contract will finish and it won't be extended. Hulhumale Magistrate Court ordered the police to produce 45-year-old Nasheed in court by keeping him in custody to face charges over the arrest and subsequent detention of Chief Criminal Judge Abdulla Mohamed. Police spokesman Hassan Haneef confirmed that the court order had been received to produce the ex-President in court on Tuesday. "Efforts are now underway to comply with the order," Haneef told PTI.